Custom coffee sleeves that will get you noticed! 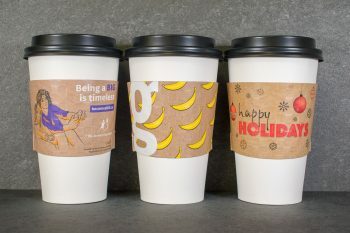 Increase brand awareness with a personalized coffee cup sleeve. Promote your cafe, business or organization with custom coffee sleeves. 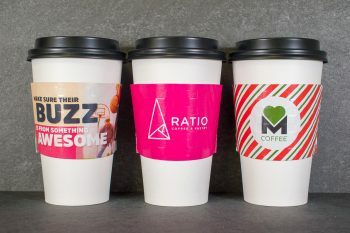 HotShot Coffee Sleeves can be personalized with full color graphics, logos and messages allowing you to put your message directly in the hands of your customers. Don’t settle for using plain kraft coffee sleeves when custom coffee cup sleeves are now affordable with minimum quantities as low as 1250. Need your sleeve in a rush? Not a problem as we offer the quickest turnaround in the industry for full colour branded coffee sleeves. Order as few as 1250! We are Canada's most versatile producer of coffee sleeves! Low minimum quantities • Multiple colour options • FREE design & proofs. We have custom cup sleeves options for full colour and 1 or 2 colour. 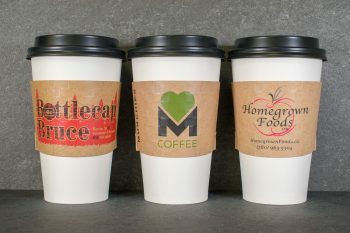 Read about our coffee sleeves. 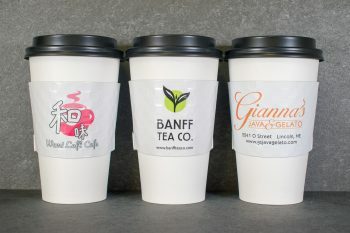 We offer competitive pricing for full colour, 1 and 2 colour coffee cup sleeves. As you order more sleeves the pricing quickly drops making your unit costs come down quickly. See our full colour cup sleeve pricing!